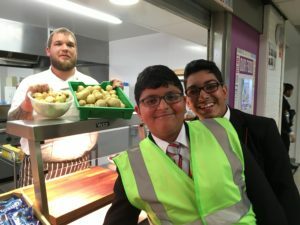 Pupils at Laisterdyke Leadership Academy have been tucking into school meals made with produce grown in the school grounds. Our team of ‘Eco Warriors’ have been working alongside Art Technician Jane Stables since the beginning of the year on a project that has seen them create a school garden and plant their own fruit and vegetables. Pupils gave up their own time at lunchbreaks and after school to support the project, developing new skills in gardening and landscaping. This project has also been incorporated into Year 7 Citizenship lessons involving pupils in litter-picking to improve the local environment. Year 8 and 10 students have also been involved with painting a large scale mural in the Eco Garden. Working together, pupils cleared an overgrown area and built raised beds from old pallets in which they planted fruit crops that yielded strawberries, raspberries and gooseberries in the summer. 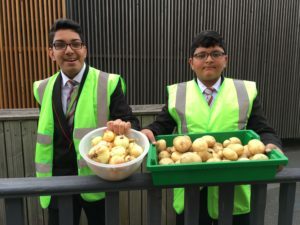 Now, as the growing season comes to an end, Year 10 pupils Hamza Amir, Haseeb Hussain and Ubaid Ur-Rehman have harvested onions and potatoes grown in planters that they made themselves from discarded car tyres. Our school kitchen staff turned these into a variety of meals for the lunchtime menu, including savoury sauces and mashed potatoes. “At the start of the year we decided to reclaim a disused area of the school grounds and our former Eco Pod to develop an Eco Garden and encourage pupils to get involved in a gardening and nature project. 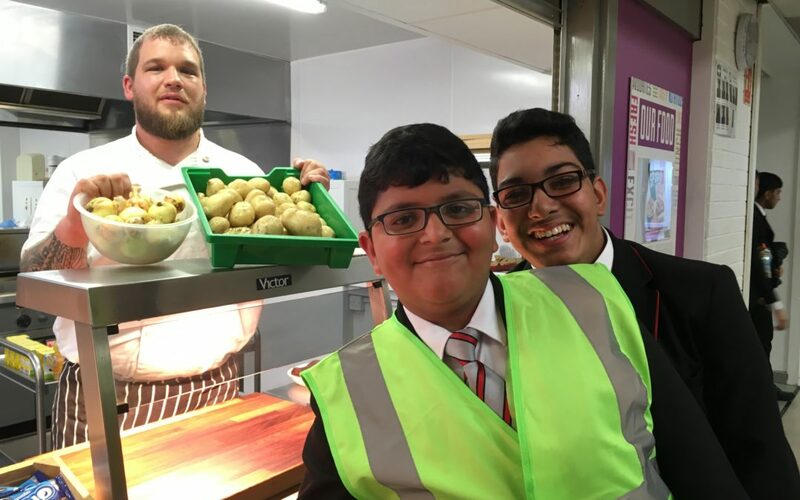 In total around 50 pupils have been involved, and I have been impressed with how some have freely volunteered their time and energy – in all weathers too! “As well as learning about ecology, gardening and caring for our environment, my team of Eco Warriors have learnt so much about our school’s specialism of leadership and the skills and capabilities needed to motivate others to join them in their task. “I got involved with the Eco Project to help improve the school’s environment by making the new garden and pond and also painting areas that were looking tired. “This project has been a great chance to learn new skills. We have learnt so much about gardening and landscaping, but also communication skills and teamwork.